Jerry Bridges has a solid reputation for pointing believers to the cross, and this book is no exception. 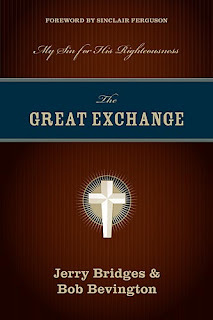 Built on the model of an older work called The Apostles’ Doctrine of the Atonement, The Great Exchange is a meaty exposition of the gospel: the death of Christ in the place of condemned sinners, and the gift of his righteousness imputed to their account. I was only three pages in when I began to think, “this is a very good book,” and I never changed my mind. The book is written in two parts. Part I is an overview of the atonement, summarizing the NT’s teaching and giving a great explanation of the OT backgrounds. This first 75 pages or so could really stand alone as a teaching tool to give believers a better understanding of what the cross means. Part II goes through each book of the NT, shows that book’s unique contribution to the doctrine of the atonement, and closely examines the key passages of each book relating to the atonement. The book has a few minor weaknesses. There is some repetition, which is understandable given the goal of addressing every major passage on the atonement. There were also places where I felt like I was reading true statements, but not true statements that were drawn from the Scripture at hand. Lastly, at a couple of points I felt Bridges and Bevington’s defense of limited atonement was weak. None of these, however, make me hesitate to give this book an enthusiastic thumbs-up. In the foreword, Sinclair Ferguson writes, “Here is spiritual food to be chewed and digested.” He is right. The Great Exchange is not a page-turner, one you plow through and then move on. If you read it that way, after a while you’ll burn out. It’s a great book to use as a guide to an extended study of the Bible’s teaching on the atonement– I think it would be great to use in a yearlong Bible study or even in personal devotions. However it’s used, it is a great presentation and explanation of the gospel, the truth to which we all need to keep returning every day: my sin for his righteousness.